Spending a day at the Epcot International Flower & Garden Festival is always a wonderful way to welcome Spring. 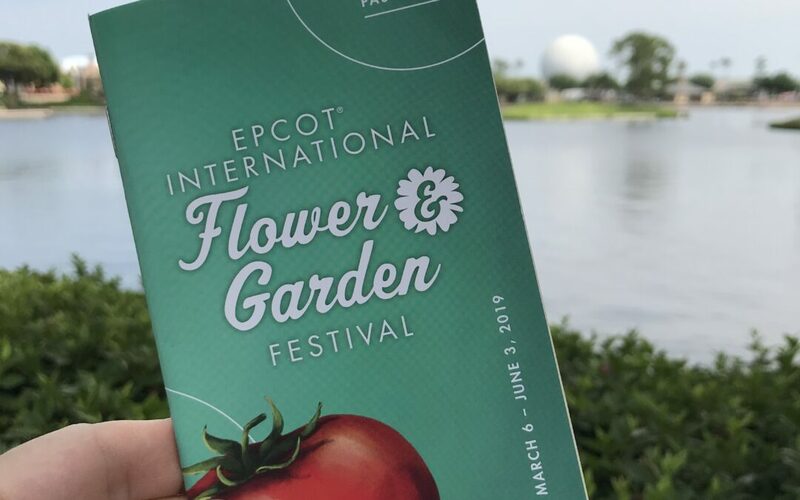 I envy those who are blessed with a green thumb and can truly appreciate all the horticulture and expansive variety of shrubs, flowers, and exhibits. Unfortunately, I’m not one of those people. I just think it’s pretty. What I can appreciate and understand on a deeper level is the FOOD! The outdoor kitchens which appear during the Epcot International Flower & Garden Festival aren’t as expansive as those you find during the Epcot International Food & Wine Festival, but they are nonetheless filled with scrumptious bites! One of the most popular beverages this year was the Orange Cream Slushy in a souvenir Orange Bird Sipper Cup from The Citrus Blossom (located in Showcase Plaza, near Port of Entry). 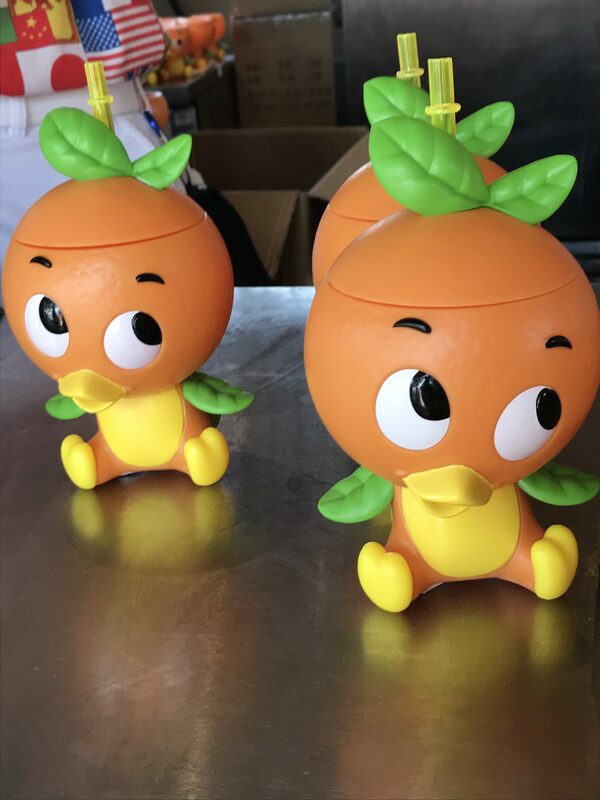 Actually, I think the Orange Bird sipper was the bigger hit here. The cups were sold out within days of the Festival opening. But, fortunately, they were back in stock for our visit, so we were able to try it. The slushy was exceedingly sweet, and more like a smoothie texture than a frozen slushy. But the sipper is definitely a fun souvenir! A perennial Flower & Garden favorite is Violet Lemonade. In fact, this year, there is merchandise devoted to this refreshing taste of Spring. 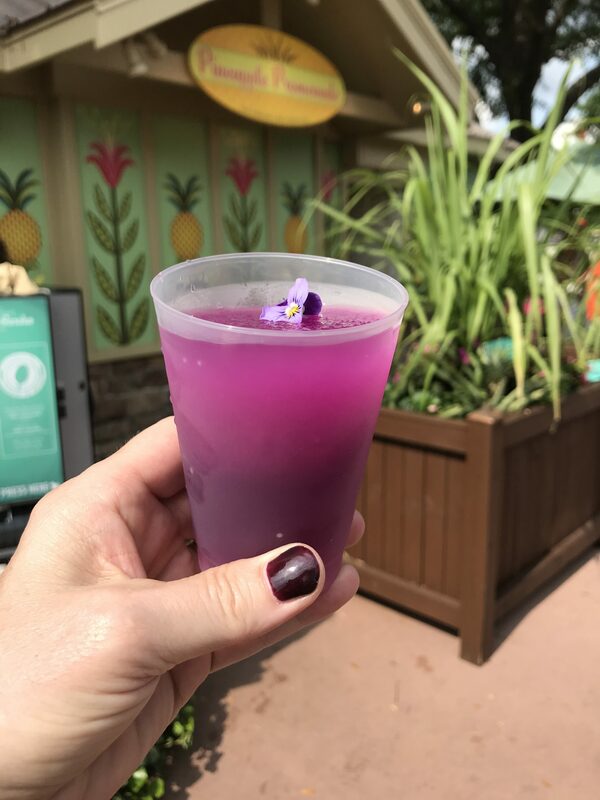 As usual, the Violet Lemonade did not disappoint – fresh, frozen, and a flawless combination of sweet and tart. Its gorgeous violet color is a perfect tribute to Spring. You can find it at Pineapple Promenade in Showcase Plaza (near Port of Entry). The Honey Bee-stro is back this year, and I highly recommend the Local Wildflower Honey-mascarpone Cheesecake. We tried it last year and fell in love. It’s a great combination of honey and orange without being overpowering. The Bee-stro is located in Showcase Plaza near Refreshment Port. 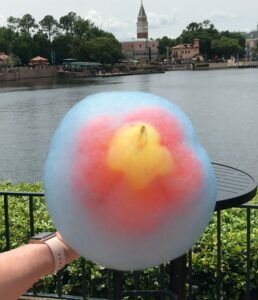 A new offering which is very popular is Chinese Cotton Candy – hand crafted artisan cotton candy at Lotus House in the China pavilion. Diva Tip: There is a separate entrance on the other side of the booth to order cotton candy, so don’t make the mistake of standing in the line to order other offerings from Lotus House. The line to order can be very long – I’ve heard reports of up to an hour! – but the day we visited it was only about 20 minutes. You can choose from several options of cotton candy with varying degrees of layering. Each order is hand crafted right before your eyes, and it definitely is a wonder to behold. (You can watch a video on our YouTube channel, here.) I’m not a huge fan of cotton candy – I enjoy a bite or two when given the chance but don’t usually go out of my way to indulge – but this cotton candy was extraordinary! It was exceptionally light and fluffy and three of us devoured it within about 3 minutes. 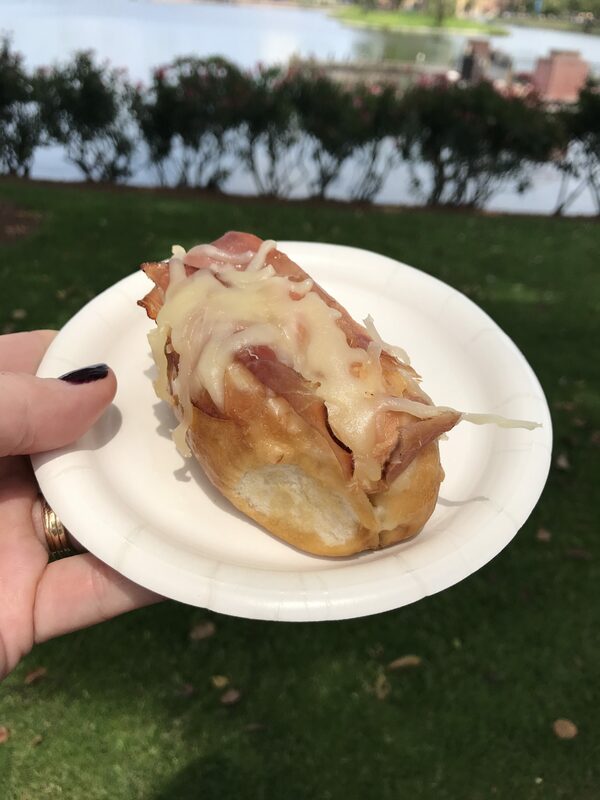 At Bauernmarkt in the Germany pavilion we tried Toasted Pretzel Bread topped with Black Forest Ham and Melted Gruyere Cheese. I was a little disappointed in this. I found the bread a little too doughy and not salty enough, although the ham and cheese flavors were good. My husband and son disagreed with me – they thought the pretzel bread was wonderful. 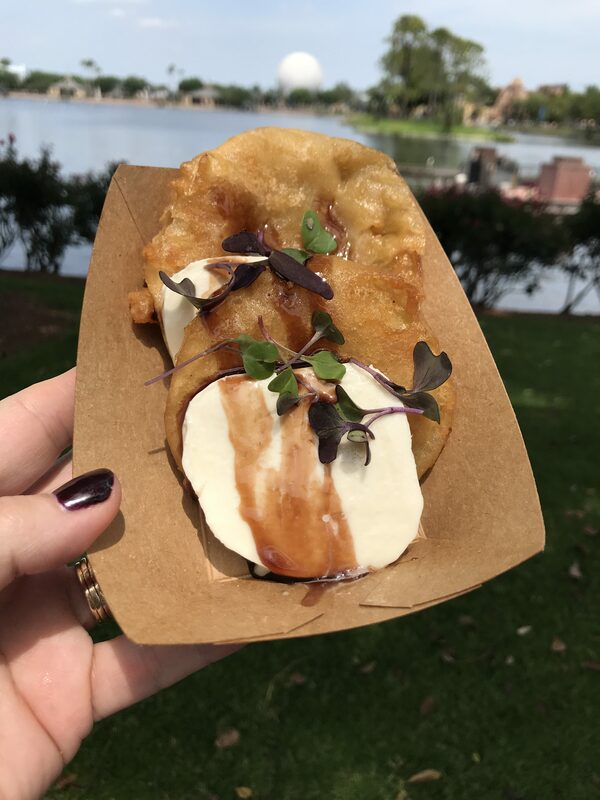 In the Italy pavilion we (well, mostly my husband) enjoyed the Pomodori Verdi e Mozzarella (fried green tomatoes, mozzarella cheese, balsamic reduction) from Primavera Kitchen. I was surprised at how thick the slices of tomato were – and the cheese was a wonderful complement to it. The breading on the tomato was not too heavy, and the delightfully tangy taste came through nicely. Diva Tip: The service here was very slow on our visit – hopefully just an aberration. But plan accordingly. 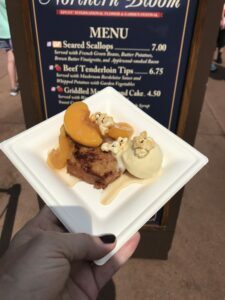 In the American pavilion I wanted to have the Pulled Pig Slider and Warm Chocolate Cake with Bourbon-salted Caramel Sauce and Spiced Pecans. We loved both of these items last year and were looking forward to a repeat visit. Unfortunately, the line at Italy had taken so long we were running short on time, and there were still kitchens I wanted to visit. Since we had had a chance to sample these last year, we didn’t stop. But if you have the opportunity, I’d highly recommend them both! I am not a sushi fan, but last year I tried Frushi in the Japan pavilion. A rather bland but sweet combination of fruit and rice, it wasn’t something I was interested in sampling again this year. Instead, at Hanami I chose Karaage with Nanban Sauce (Japanese-style fried chicken served on a bed of shredded cabbage and topped with a soy and vinegar-based dressing). It was good! 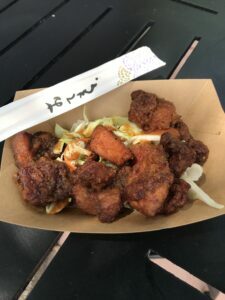 The chicken resembled sweet and sour chicken – bite size pieces fried and coated in a sauce. The cabbage was extremely crisp and fresh, and the dressing was not overpowering. At Taste of Marrakesh in the Morocco pavilion we chose the Walnut Honey Baklava. I mean “walnut” and “honey” – what’s not to like? It didn’t disappoint. 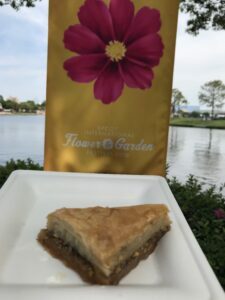 It was a little difficult to cut with the plastic silverware because it was so sticky, but it had a pleasant aroma, the pastry was flaky, and the flavors were scrumptious! 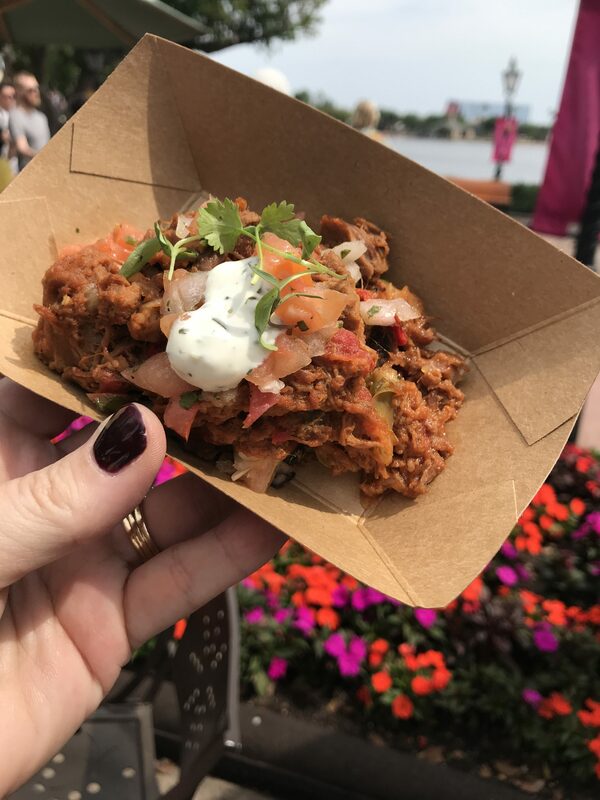 The Carne Guisada with Black Bean Cake and Cilantro-lime Sour Cream from Florida Fresh (between Morocco and France) was definitely a hit with our group. The meat was savory with a little spice, but not hot. The cilantro-lime sour cream had a fresh and flavorful taste making it a nice balance with the meat. Finally, at Northern Bloom in the Canada pavilion we chose Griddled Maple Pound Cake with Warm Peach Compote and Sweet Corn Gelato. The pound cake was good, but nothing exceptional. The peaches, though, were amazing! It was served with a few kernels of maple popcorn on top as a garnish, something we found amusing. If you’re looking for a more substantive dish, I’d recommend the Beef Tenderloin Tips. By this time our appetites were getting saturated and we didn’t order them, but we’ve tried them in the past and they have always been delicious! 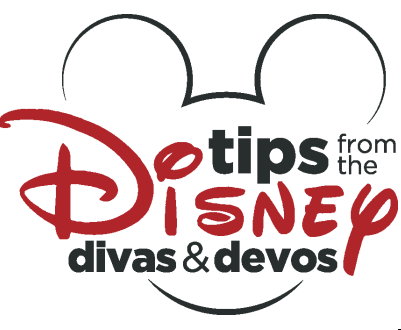 Diva Tip: Most of the items we sampled are eligible as a snack credit on the Disney Dining Plan. 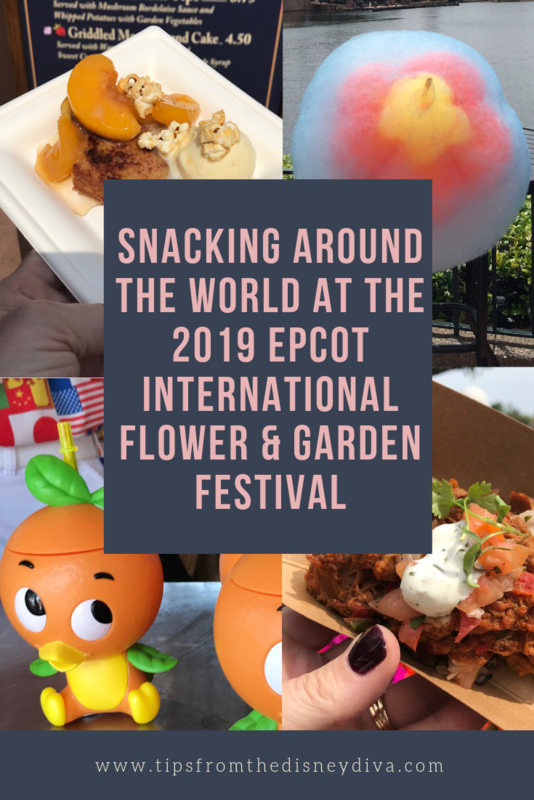 Snacking your way around the world is a great way to use those snack credits! Even if you aren’t using the dining plan, you can still sample lots of dishes without breaking the bank. We spent about $75 for 3 adults to try all these items, and it replaced a meal we otherwise would have had. Anything (or everything?) look good? Are you ready to plan a visit to Epcot to enjoy some of these amazing dishes? Or maybe you’d like to try the Food & Wine Festival? Whatever you’re preference, Patricia at All for Dreams Travel can answer all your questions and provide you with a FREE quote for your vacation! Don’t forget to pack those stretchy pants.